This blush deserves a post all by itself. It's a wonderful shade of rosy wine, and I'm sure it would go nicely with any skin tone. I'm extremely fair, and this blush breathes life into my cheeks. It's a drugstore product that could rival any high end blush. 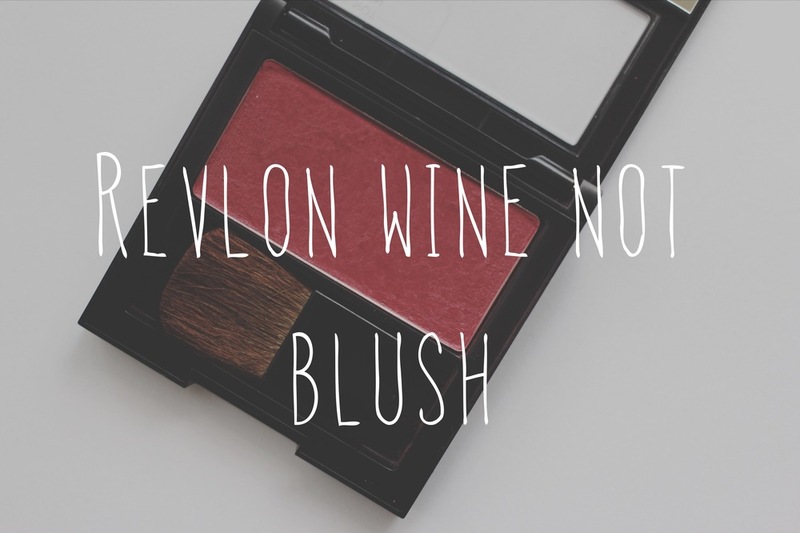 This blush is in the shade Wine Not (very witty). It is a powder blush that just feels creamy on the skin. It doesn't feel heavy or cakey, and goes nicely over even my base of the Clinique CC Cream. See my review on that here. It brightens up your whole face, and pairs well with berry, pink, or even coral toned lips. I think this blush colour can take you through every season. For fall and winter you want more of a berry or deeper shade on your cheeks and it does this. In the Spring, I'm finding that it couples nicely with all of my lighter makeup as well. It's a great piece for a minimal makeup look. Next time you're looking for a versatile blush, try this one out! I use it with my e.l.f. contour brush, which is another steal at only $1.99. The quality of the brush is great, and since it's a contour brush, its great for blush or bronzer. I do not like foundation. At all. I often find it to be heavy, and not really appeasing on my face; I'll only wear it for those days when I really need to look good. That's why when I want some coverage, I want something light, fresh, and it doesn't hurt if it has an SPF (I'm all about the SPF). The Clinique Moisture Surge CC Cream fits the bill like no other. I wear the shade "Very Light" because I'm very fair, and would like to think I have porcelain skin. In the summer I usually wear the shade "Light" since I'll have a bit of a "tan" (not really). Its an all season, all purpose kind of base makeup. I love this CC Cream because it's light, gives your skin a dewy finish without being greasy, and overall does cover what you need covering. It also does a great job of keeping your skin moisturized. Not to mention it boasts a SPF 30. The CC Cream creates a perfect light base for the rest of your makeup. Also, it goes on so nicely with just your fingers. No brushes required. It is so quick and easy to use, and you don't need to spend time on blending and making sure you look "natural". Now it is on the more pricier side of the spectrum retailing at $39.99, but it does last ages. I had one for about a year and a half, and I would use it quite often. Clinique is a great brand that caters to most skin types as it also works for sensitive skin like my own. Next time you're looking for a lighter foundation alterantive, especially with Spring here, try this one out. Let me know what you think in the comments below of this CC Cream or any CC Cream you've tried. Please follow me on instagram, bloglovin, and twitter for updates on blog posts, food, and of course, for photos of Bingley! There are the days when sleep isn't just possible. Either you know you're supremely stressed or you're not very tired due to a disruption in your sleep cycle, or you're overtired and left wired. I have a few tricks up my sleeve that help me, and will hopefully help you! The biggest rule of thumb I think is to tire yourself out. Do as much as you can in a day to be productive and also help your sleep cycle. If that isn't enough, then make sure you add in a workout. Working out can release stress, toxins, and will help you sleep better at night. Also try a yoga routine when you wake up or right before bed. I find yoga to be a great help. Have a sleep routine in place. By this I mean to go to sleep at almost the same time per day and wake up at roughly the same time. If you keep this in check it should keep your inner clock in check too. Set time before bed to relax. This is key. Either you can read, watch TV, lie down, anything that lets you relax. Then before bed, unplug yourself from the world. Try a bath or aromatherapy. There are plenty of bath salts and body lotions that can help with sleep. Look for products with lavender in them as lavender is a good sleep aid. Some of my favourites are from Bath and Body Works and Johnson & Johnson's Baby Bedtime Lotion. My pup, Bingley, is a great sleeper. Hopefully this will help in getting a better sleep. If not, try counting some sheep. Happy sleeping! Canadian Winters are cold, bitterly dry, and snowy. Luckily this year the winter is only really cold with manageable snow so us Ontarians are able to keep up (not like last year). As I write this, 10 cm of snow is coming down, and I'm really enjoying the beauty of it. Snow days give us a day to actually rest. It's a day where you can kick up your feet, cozy up, and really enjoy the warmth. I unfortunately have essays to right so I'm not completely relaxed at the moment, but after they're done I could be doing any of the following snow day activities. (These are solely indoor) Make some comfort food. Make food that is slow cooked or that is a treat for yourself. Warm food, warm heart. Catch up on some reading. I have so many books that I want to read leisurely, and a snow day is the perfect opportunity to get through a book. Watch TV or movies. (Possibly binge watching) TV shows and movies allow you to forget about reality, and escape into comedy, romance, history, or even other peoples' realities. Watch whatever meets your fancy, and enjoy it. Hot drinks. I drink hot chocolates, lattes, tea, and coffee on a regular basis but a snow day is the perfect opportunity for hot chocolates topped with whip cream and those yummy marshmallows. It could also be hobby time. By that I mean that if you have a hobby, make some time to do it. Whether its knitting, painting, or anything else, do it and enjoy it. Lastly, all of these activities can only be possible if you're wearing comfy clothes. I personally like to dedicate a snow day into a pj day, but sweats, leggings, anything that is not restricting is allowed. I'm all for the cozy comfortable look. These are some examples of things to do on a snow day. Essentially a snow day should be a day where you can take a day for yourself and enjoy the things you like to do. Make sure its cozy, cuddly, and full of heart warming things. Bingley loves snow days. He loves to watch the snow come down for hours. Follow me on instagram @melodyannep and bloglovin. Cheers! I should start off by saying that most of my days involve detoxing my skin. With that I mean that I barely wear makeup and I try to be as conscious as I can with what I put into my body. January is a perfect time for a skin detox as the holidays involved lots of makeup, late nights, and lots of treats. There are a couple of things you can do to really give your skin a break so let's get started! The first thing you can do is make sure you cleanse and moisturize your face (and body). A good cleanse starts off with using warm water or a hot cloth to open your pores, and is followed by a gentle massage on your face. I'm a firm believer in toner, so I always follow my cleanse with it to ensure that my pores are completely closed. During the blistering cold it is important to use a thicker moisturizer to really protect your face, and also one that has an SPF in it. There is still lots of sunlight in the winter that can damage your skin. A skin detox is only possible when your skin is protected properly. Another thing you can do is keep makeup minimal, or don't wear it at all! Try for a couple days of no makeup to let your skin really breathe. A hot bath or shower can also be really cleansing. Add sea salt or epson salt to a bath or even a foot bath to rid yourself of inside toxins. It'll allow you to relax and will do good to your inside. When it comes to inside out beauty, water is the best to really cleanse your skin. I drink about 10-12 500 mL bottles of water per day to help with hydration and detoxing. Also try a gentle food detox for a couple of days that involves lots of produce. Hopefully you find these tips useful in detoxing your skin and overall in inside out beauty. Follow me on instagram @melodyannep and bloglovin! The other day I purchased the Mint Julips Lip Scrub from LUSH. It was $9.95, and worth every penny. It expires in a years time, and I've deemed it an essential for not only cold weather, but the entire year. It's safe to say that I love this product! I'm a fan of LUSH products, and I will have another post for some other purchased products coming up. I like that everything they use is fresh, natural, is not tested on animals, and mostly everything is vegan. Their products are not toxic and you're really putting your money into good health for yourself. The scrub does exactly what you think it does. It takes off all those nasty chapped pieces and white bits of dry lips. You take a little bit and rub it over your lips. You move it around until all those nasty bits are gone, and you can lick it up! Mint Julips is a nice minty and sugary flavour that slightly pumps up your lips and leaves you with a nice minty taste in your mouth. There are other flavours as well, like Popcorn, and I can't wait to try them. I am completely satisfied with this product, and I can't believe I did without it before! This lip scrub is a must have for cold weather, and will make the world of a difference to you (well, your lips)! If you have it, let me know what you think about it. If you have other LUSH products, let me know which ones you love because I'd like to try them! I'm a huge fan of Drew Barrymore. I love her films, how she looks on the red carpet and now I love her new beauty line. Flower Beauty offers high quality cosmetics at ridiculously great prices. It launched at Walmart in mid October. Her line of products includes everything under the sun. Powders, foundations, concealers, lipsticks and glosses, eyeshadows, brushes, you name it! I picked up three of her products, each under $10, and I am now a lover of her line. Last weekend I had a wedding, and last minute realized I didn't have the dark burgundy lipstick I thought I had. So I headed over to my neighbourhood Walmart, and looked all over for a lipstick, but couldn't find one. Then I saw the very pretty and white Flower Beauty section, and found the perfect lipstick. This was the Kiss Stick Velvet Lip Colour in the shade LS21 Desert Flower. This lipstick lasted through an entire wedding of eating, drinking, and dancing and I did not get a ring around my lips at all! It's so smooth and really does make your lips feel like velvet. It is the perfect burgundy lipstick, and honestly, I think it beats out any other lipstick, high or low, out there. I also picked up another lipstick in the shade LS3 Tender Tuberose. It's perfect for daytime, and has a mauve undertone to it. Another favourite. I bought the Loose Powder in the shade LO1 Light. I've never used a powder over top of my foundation before, despite probably needing it since I have an oily t-zone. Again, I was not disappointed. Lightweight and did the job perfectly. I will be trying out many more products, and definitely some of the brushes from Flower Beauty. Another bonus about the line is that nothing is tested on animals! These cosmetics feel high end but are at a very reasonable drugstore price. I'm a firm believer that one shouldn't be spending an arm and a leg on beauty products, but I still love to try out new things. Give Flower Beauty a go and your wallet will thank you! Ps. Follow me on Instagram @melodyannep and Bloglovin! Hello! I recently splurged and bought three new skincare products. It was just my birthday so I thought I'd treat myself. I purchased the Clarisonic Mia, the First Aid Beauty Ultra Repair Lip Therapy, and the First Aid Beauty Ultra Repair Cream. All three products are wonderful, but the Clarisonic is the one most worthy of a purchase! Now, if it wasn't for my birthday and have some birthday money from last year, I would not have purchased it. It was something I definitely saved for and took a long time to consider buying. I have combination skin, and suffer from tons of blackheads on my nose. After using it for only three weeks, I have noticed a difference already. My skin is softer, clearer, and definitely cleaner. The Clarisonic is meant to clean down to 6 layers under your top layer of skin. So happy with the product, and I've been using it with my cost-effective Neutrogena Naturals products (See my previous post here). Worth the purchase. The First Aid Beauty products are also pretty great. The Lip Therapy is moisturizing, and helps to keep the Autumn winds at bay. Would I switch back to my other more cost-effective lip balms? Yes. It's great, but other products do the same job. The Repair Cream is awesome on the other hand. I have pretty dry skin so I use it on my body, my hands, and my face if I need extra moisture. It's worth the buy if you have sensitive skin, and uber dry skin at that. My dad gets cracked fingers this time of year, and they've been completely healed with using this cream. Do you have these products? What are your thoughts on them? Ps. Follow me on instagram @melodyannep! Follow me on bloglovin! I don't know about you, but I love beauty products. From a young age, I've been fascinated with doing my hair and makeup (although I don't like wearing too much). The problem with loving beauty products is that my budget can't really afford to keep up with it. But I have a way of trying the products I want, without the huge price tag! The first thing you can do is go into your beauty store of choice (mine is Sephora), and pick up a couple of samples. Samples are a girl's (and guy's) best friend. They're free, give you a chance to try out that lux product, and you don't have to commit to a large price tag. The second thing you can do, which really you should do before the sampling, is become a member of the store, if given the opportunity. Sephora has the beauty insider program where you gain points, can redeem them for products, and get exclusivity to new and exciting things. Its a win win in all regards. Again, utilize those perks and you'll get products on discount or for free! What could be better. The last thing you can do, and this involves actually spending money, is buying a value set. Once you've sampled the product, and want to commit, wait for a value set to come out. You can to try new products that are most likely amazing, and you get the product you want for a fraction of the cost! I have an Origins value set coming in the mail, and I can't wait to use everything that comes into it. The whole set, which includes six of their bestselling products, is a fourth of the price! What a great deal. I'll be doing a post afterwards on the set. Getting beauty products that you want is within your means as long as you're willing to wait for good deals or simply use those samples until you've saved the money. Follow me on Instagram @melodyannep for updates on the blog, my pup Bingley, and lots of food. Last year I received a small (like a sample) bottle of Lancome's Bi-Facil Double-Action Eye Makeup Remover. I thought it was great since it did work. The only problem was that it left my eyes with still mascara underneath, and took a lot of work to get it off (eyelashes were being tugged out). The other thing was that it was supposed to be oil-free, and well, it left my eyes feeling pretty oily. This week, I found Neutrogena's Oil-Free Eye Make-up Remover. It works like a charm, really though! It's not oily at all, there's no fight in getting off mascara, and my eyelashes are left in tact. Also, it only cost $8.27. Is that a bargain or what?! These are only my opinions, but when you're on a budget, cheaper is better. But when you're on a budget and you still have standards, use the Neutrogena eye makeup remover. Sometimes the high end brand isn't always better.